The new uniform for the next generation is unveiled by The NFL and Nike yesterday. They design the new NFL dresses for all 32 teams at Brooklyn Navy Yard with a very gorgeous and glitzy event. The new NFL jerseys were modeled by Ben Roethlisberger (Pittsburgh Steelers), Alex Smith (San Francisco 49ers), Wes Welker (New England Patriots) and Ray Rice (Baltimore Ravens). Isn’t it sounds crazy? 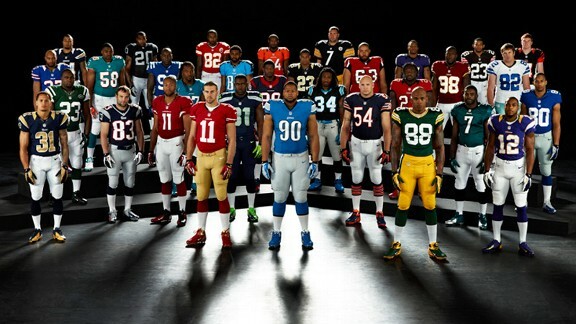 The New NFL Uniforms from Nike will go on sell from April 26 to April 28. So get ready to grab of yours one. Don’t miss the chance to buy the New Jersey from Nike for the upcoming NFL tournaments. The Seattle Seahawks design this new uniforms fashion show for NFL tournaments in America. Yesterday they make a biggest fashion show with the greatest NFL players. The new Nike jersey designed with dark blue color. These jerseys are designed especially to feel more comfortable and fit into the body. Nike CEO Mark Parker said about the new NFL uniform that it is 20-30% lighter than anytime with 4-ways stretch facilities.